A collection of 17 papers from thee popular symposia - Symposium 4: Armor Ceramics; Symposium 5: Next Generation Bioceramics and Biocomposites; and Symposium 9: Porous Ceramics: Novel Developments and Applications held during The American Ceramic Society’s 40th International Conference on Advanced Ceramics and Composites, held in Daytona Beach, Florida, January 24-29, 2016. 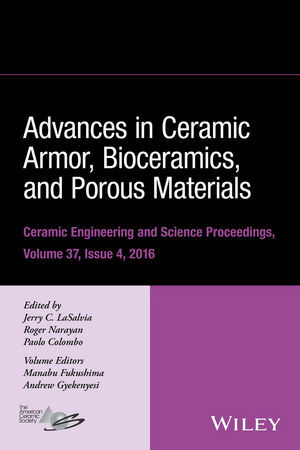 Jerry C. LaSalvia is the editor of Advances in Ceramic Armor, Bioceramics, and Porous Materials, Volume 37, Issue 4, published by Wiley. Roger Narayan is the editor of Advances in Ceramic Armor, Bioceramics, and Porous Materials, Volume 37, Issue 4, published by Wiley. Paolo Colombo is the editor of Advances in Ceramic Armor, Bioceramics, and Porous Materials, Volume 37, Issue 4, published by Wiley.